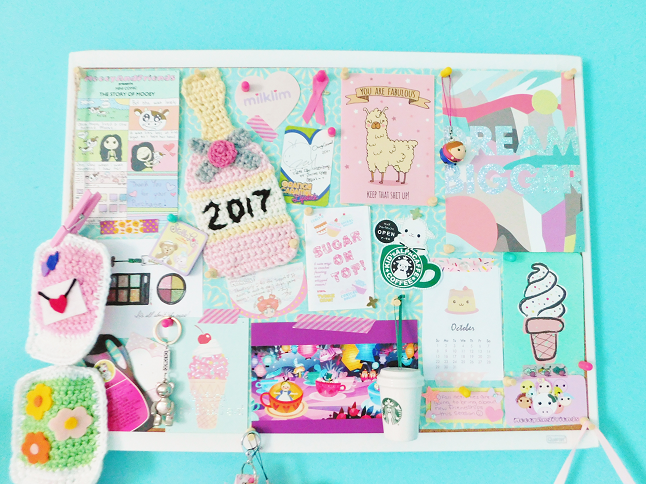 The other day I was cleaning up my desk area and rearranging my mood board and I was really content with how the finished results came out that I decide to takes some pictures and share my desk area with you today. 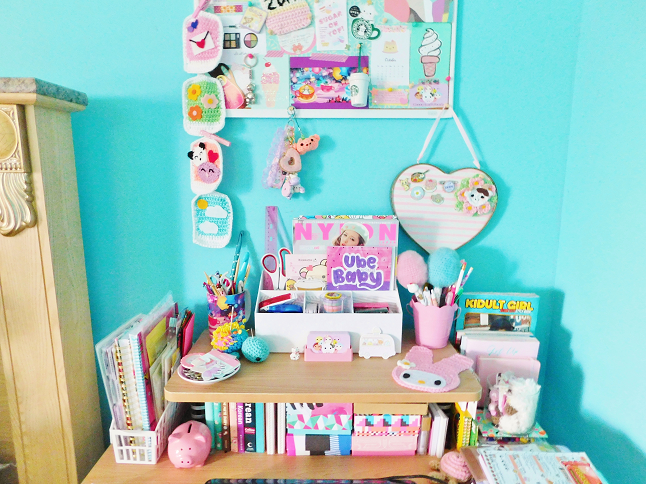 I've shared a what's on my bulletin board before and snippets of my room but I never showed my desk area before. I know my desk area isn't the tidiest and slightly cluttered in some spots but it doesn't bother me as much and actually inspires me. 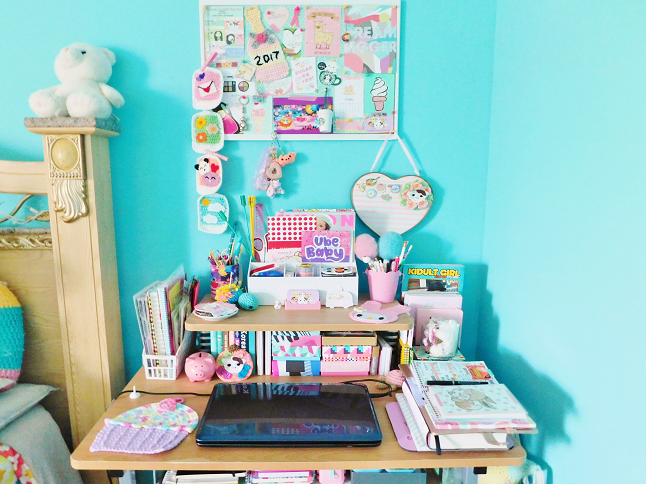 Hopefully, you guys feel inspired to clean up your desk area or create an area in your room that motivates you. Let's start with the mood board. I placed a huge piece of teal decal paper to find the cork from the bulletin board because I thought it looked cute. I pinned some old cute cards, my Mooeyandfriends comic, a 2017 champagne crochet piece, an Alice in Wonderland postcard, some old tags and notes, some prints, a 2017 mini calendar, a Chicago bear keychain, some washi tape strips, Mooeyandfriends business card and a Starbucks ornament. 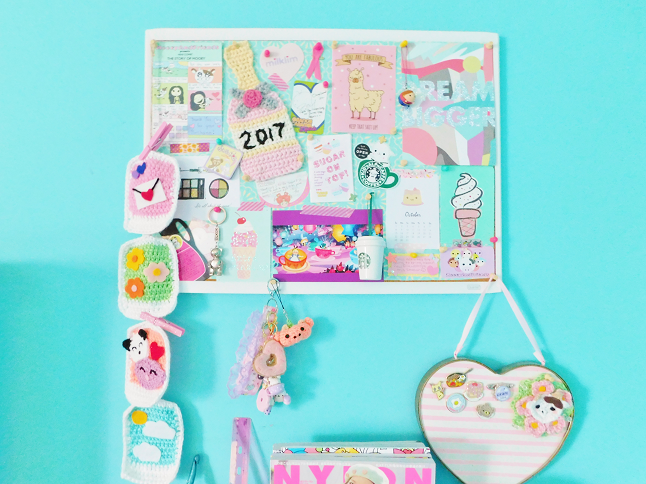 If you back up a little bit you can see a few things hanging off my mood board including my heart bulletin board where I keep some of my pins, my keychain wristlet, and my crocheted polaroid garland. On the top part of the desk, I keep a whole slew of things. Left to right, an Alice in Wonderland mug with all of my crochet hooks and scissors, a crochet turtle with my sewing needles, and a mini Marie plate with some of my planner paper clips. In the center, I have this desk organizer from Target that contains some of my favorite magazines, notes, ruler, scissors, my business cards, planner stuff, and some stamps. In front of the organizer is a mini lucky cat, more business cards, and a LuluSweetKawaiiShop sticker. On the far right, I have a mini pink scallop bucket (from the Target Dollar Spot) inside I keep a bunch of pens and other writing utensils. And finally, in front of the bucket is a crochet My Melody piece. Under the top part of the desk, I have a bunch of Birchboxes that contain a bunch of stationery supplies such as notepads, stickers, my washi tape collection, etc. On the left side of the boxes is where I keep some of my old planners, Korean dictionary, and sticker books. On the left side are notepads and colored pencils. On the outer left side, I have a magazine organizer with some of my old planner, notebooks, and random stationery supplies. 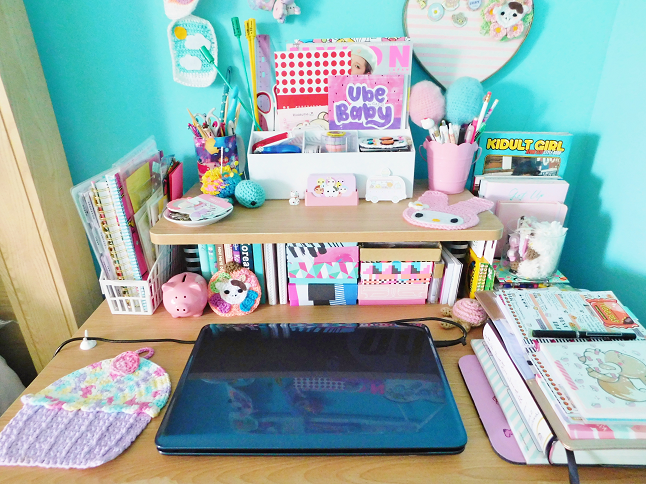 On the right side is another magazine organizer with my collection of Harajuku model books, a pink 'let's eat cupcake' notebook, a glass car with some random junk inside, and some notecards underneath. Finally, if you back up you can see a crocheted cupcake coaster, my laptop, and a stack of madness! Within the stack is a Pusheen weekly scheduler, The Familiar, and my mini happy planner with a sticker book on top. That's it! Would you like to see more sections of my room? 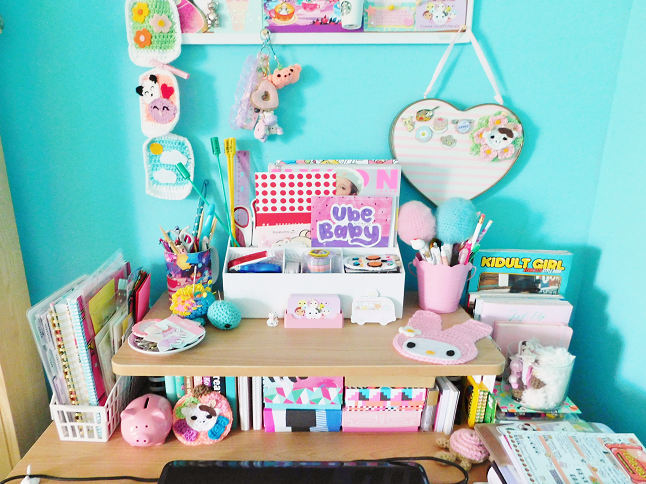 This looks like such a cute and organised area. So kawaii!